The basics of online poker strategy include an integral understanding of the poker hand rankings. Bluffing allows players to make their opponents fold their hand. However, if two or more players do not fold, then the highest hand wins. As a general rule, the poker hands that are harder to obtain have the greater odds, and thus, are higher in value. Rankings can also be affected within each category depending on each player’s holdings, which may need to be evaluated down to the very last card. High CardThis is the lowest possible hand. It means that each individual card in the player’s hand is different from the others in rank. The ranks from lowest to highest are 2, 3, 4, 5, 6, 7, 8, 9, 10 (or T), Jack (or J), Queen (or Q), King (or K), and Ace (or A). Therefore, the lowest possible hand in this category is 23457, varying in suits. Note that the suits are the symbols on each card. They represent clubs, diamonds, hearts, or spades. The best hand in this category is 9JQKA. Notice also that the cards cannot connect in consecutive rank which is why the lowest hand skips the 6 whilst the highest hand skips the T. Also, when opponents both have the highest card such as the Ace, then the 2nd highest card is evaluated. Therefore, 9JQKA beats 9TJQA because A+K beats A+Q. If the two highest cards match then evaluation continues to the third highest card and so forth. Finally, if all cards are equal in rank, then it is considered a tie and each player will split the winnings. PairThis is 2 cards of the same rank. For example, AAJQT. 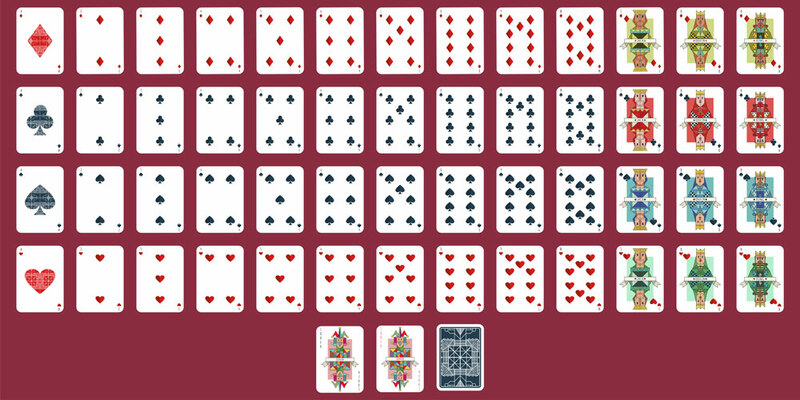 Two PairThis is 2 pairs of 2 cards of the same rank such as JJ229 or 77883. Three of a KindThese include 3 cards of the same rank. For example, TTTAK or 565J5. 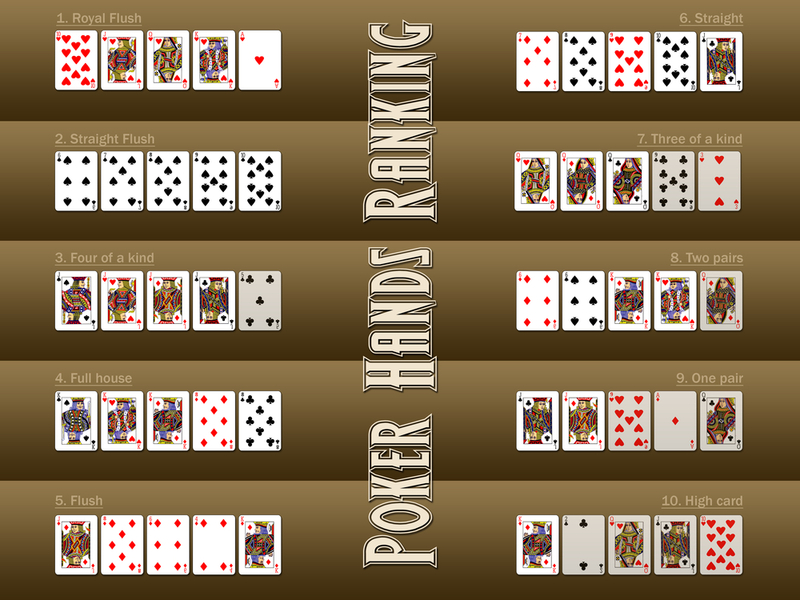 Note that no matter how the cards are displayed on the screen, each hand is evaluated by the computer based on the content of the hand. So, 565J5 is the same as 555J6. This applies to all hand rankings. The order in which they are displayed on the screen does not matter. StraightThese are cards of consecutive rank such as 789TJ, A2345, or TJQKA. Note that the Ace can be used for the lowest straight, as in A2345, or the highest, as in TJQKA. FlushThese are cards in the same suit. For example, all clubs or all diamonds. Note that no one suit is better than another. However, the strength of each flush is determined by the highest rank. Therefore, a flush with an Ace would beat a flush with a King as its highest rank. Full HouseThis is 3-of-a-kind plus a pair. The best full house is AAAKK and the weakest is 22233. Four of a KindThese include 4 cards of the same rank such as AAAAK or 22223. Straight FlushThese are all 5 cards of both consecutive rank and of the same suit. The best hand in this category is 9TJQK of any suit. The lowest hand is A2345 of any suit. Royal FlushThis is the best possible hand. It cannot be beaten. The player has TJQKA in the same suit. There are only 4 combinations that make this hand, one for each suit. It is more important to try to evaluate what cards opponents are hiding. For example, factors can include the face-up cards that all players can see, how they are betting, and/or by picking up opponents’ mannerisms and expressions called “tells”. Also, examining their previous playing patterns will give insights to what opponents are holding. Size bets and make bluffs accordingly, but it is important for each player to remember the strength of their own hand. If two or more players have not folded, then the remaining players show their hands. This is called the “showdown” and the highest hand wins. Good luck!